This is the second post about the newest animals to appear during the Aquarium's Live Animal Presentations. Get up to speed on Eastern box turtles in this previous post. Although they have a variety of habitats, box turtles greatest threat is habitat loss or fragmentation. 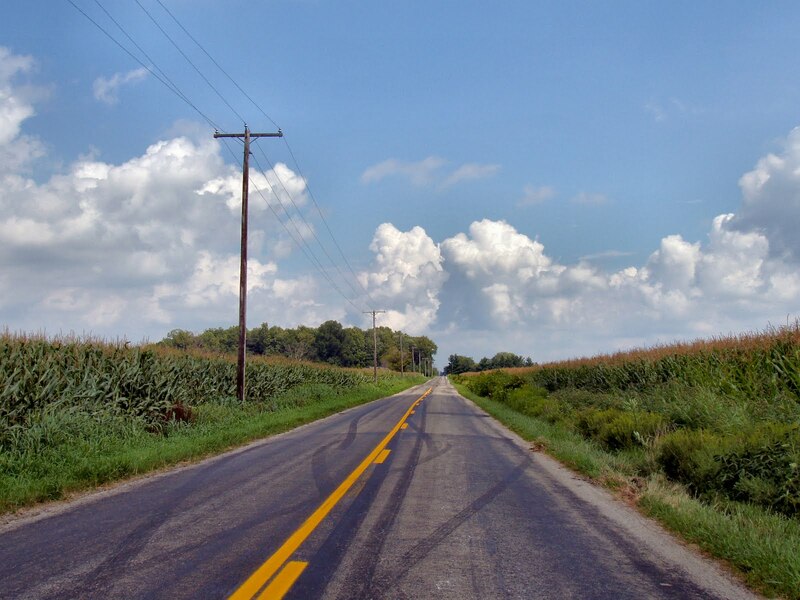 Fragmentation occurs when habitats are separated by land that humans have developed. The fragmented habitats tend to be very small, resulting in a loss of biodiversity. When confined to smaller areas, turtles may have a difficult time finding food or mates and as a result may suffer from inbreeding and other genetic problems. Massachusetts alone loses about 40 acres of natural habitat per day to development (Mass Audubon Study from 2003). Restore vegetation (like your yard) to a more natural state. Use native plants! Avoid using herbicides, especially on fruiting plants. Box turtles reach sexual maturity at about 5 to 10 years old. In Massachusetts, females usually don’t lay their first clutch until 14 years of age. Females can store sperm for up to 4 years! They sometimes travel up to a mile to find suitable habitat and lay between three and six eggs each spring in a shallow nest. The eggs are left unguarded and hatch in summer to early fall. Over the span of one lifetime, females lay hundreds of eggs, but only two or three will survive to adulthood. These eventually replace their parents in the population. However if box turtles are removed from the wild, this reduces the breeding population, creating a decline in total population numbers. 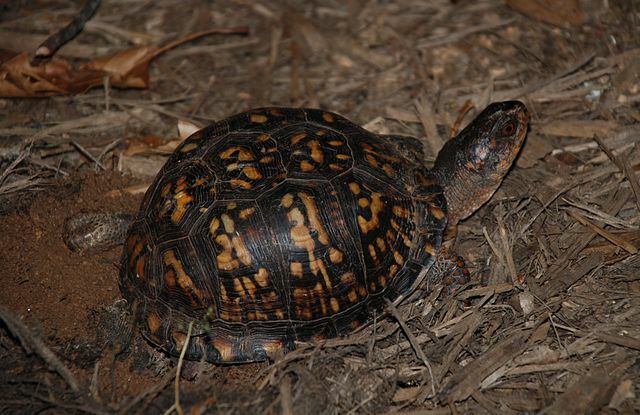 Male box turtles have wider tails, more flattened shells, and dark orange or red eyes. 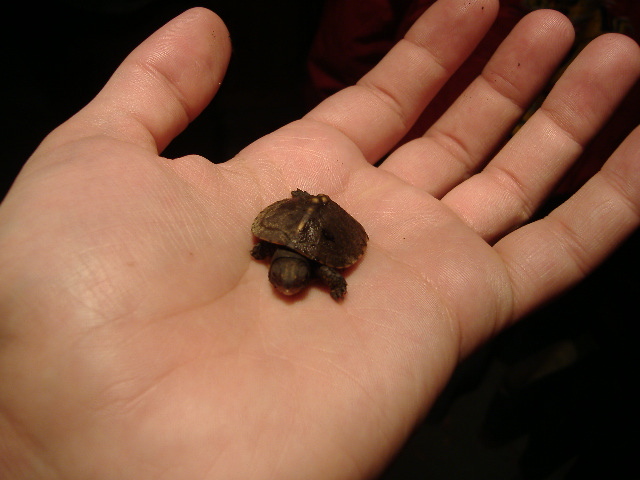 Females box turtles have brown or light orange eyes. Because box turtles are long-lived (30-50+ yr. lifespan), slow to mature, and have few offspring, their population is vulnerable to habitat disturbances, motorized vehicle kills, high levels of predation, and loss of individuals through the pet trade. Eastern box turtles are listed as a Species of Special Concern in Massachusetts and are protected from commercial trade under CITES (Convention on International Trade of Endangered Species of Wild Flora and Fauna). They are also being protected by YOU, when you share what you've learned about these unique turtles and inspire stewardship. Good Job!